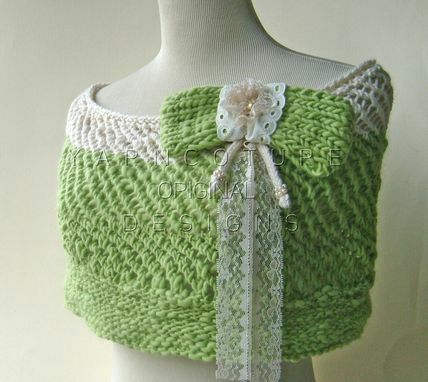 Hand knit from some incredibly soft spring green merino wool yarn that I spun myself by hand, this beautiful capelet is very expressive yet subtle. Touches of cream andean silk and merino wool yarn began atop the capelet and then my hand spun merino is gradually added to complete the body of the capelet. The slightly thick and thin qualities of my handspun yarn give the capelet a unique sense of character and is hand knit in a beautiful breezy net pattern. The oversized bow brooch is accented by two cream ties with pretty pearl beads circling the bottom. Eyelet trim and lace are higlighted by a beautiful pearl in the center. So special, this capelet can be worn for very special evenings, as a bed-capelet or anytime you want to feel special.